If you are looking for a quality online casino to play at, it is worthwhile to try out Everest Casino. The casino offers a wide range of games and impressive bonuses and promotions to create a top online casino experience. 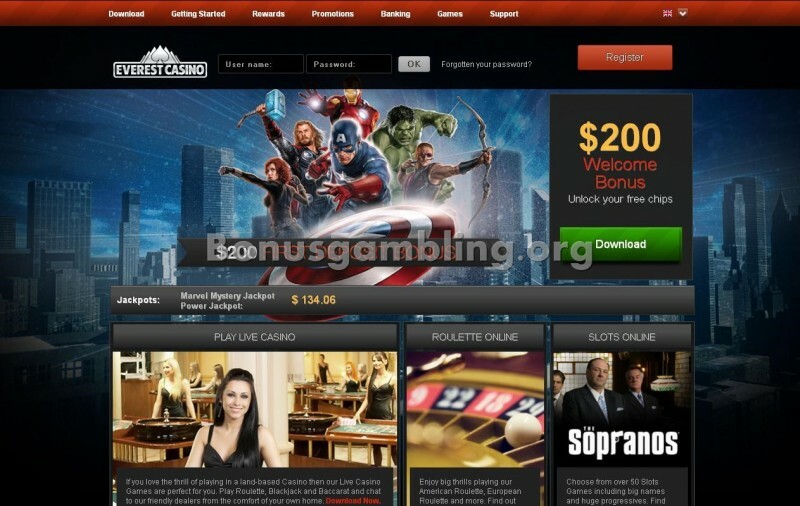 The home page of the casino is well set-out and attractive, drawing you to take a closer look. There is plenty of information right on the home page with simple to access links for any other information you may need about playing at the casino. Everest Casino is powered by the online casino software provider, Playtech and can be downloaded onto your computer with no hassle, allowing you to play all of the games in their games suite. Once you have downloaded the casino, you must register and open an account and you will then be ready to begin playing any of the available games. The features and functions at the casino allow you to enjoy your gaming experience. The graphics are bright and clear, making them stand out. The casino software supports play in multiple languages, including English, German, Portuguese, Polish, Swedish and Japanese, making the casino accessible to players around the world. At Everest Casino you can enjoy more than 150 different game titles from the categories of table games, card games, video poker, slots, live dealer games and progressive jackpot games. Favorite games at the casino include multiple variations of blackjack and roulette and much more. There are more than 50 different slots games with popular titles such as The Sopranos, Marvel hero slots, Bay Watch and John Wayne. Live dealer games include live blackjack, live roulette and live baccarat. New games are introduced every month. All games can be played for free in the fun mode of the casino. Everest Casino offers customer support that is available to answer any questions you have when playing at the casino. They can be contacted via email or instant live chat. Everest Casino is owned and operated by Everest Gaming and is licensed by the Government of Gibraltar. Everest Casino does not accept US players and all players must be at least 18 years of age to play at the casino. There are so many online casinos around today, but Everest Casino caught my attention when I was looking for a casino to play at. Besides for its impressive features, it offers a great variety of games, plus a number of worthwhile bonuses for new players. The welcome bonus offers at Everest Casino caught my eye as there are actually a number of bonuses available. On my first deposit into my account I was awarded a 100% match deposit bonus up to $200. The rewards did not stop there and I was able to collect another $300 worth of bonuses to use to play. On my 2nd, 5th and 10th deposits I claimed 50% deposit bonuses up to $50, $100 and $150, respectively. That is $500 of bonuses that I used while playing at the casino. Everest Casino was certainly worth the visit and I would recommend it to all my friends.